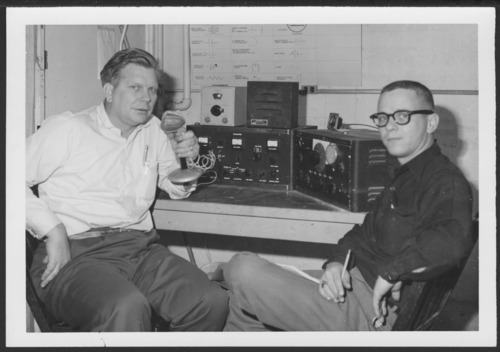 This photograph shows Ken Dugan and Dean Page at the control board of KQWIA, the Menninger patient built and run radio station. Dugan and Page are activity therapists. The Menninger Clinic philosophy of treatment was the bio-psycho-social approach. This philosophy of treatment integrated medical, psychodynamic, developmental, and family systems to treat the total health of patients.